It seems like I and a lot of other interweb folk have been truly had – see my last post. In a very clever way W+K and Old Spice are pulling our leg: Fabio, the usurper of the scented throne has been copying the famous Responses with mixed results. But now is throwing down the gauntlet, challenging Mustafah to step up. Respect to the creatives for reinventing the game and playing with social media in a new way. Because naturally Mustafah accepted the challenge and there will be a showdown. As you can see from the Mexican wrestling-style announcement, it will be hand to hand combat in the bath (mano a mano in el bano). I am expecting a duel of wits, long flowing hair versus presidential abdomen, taking place in the ‘Internet Arena‘. It is about to go down in a good 7 hours (high noon EST in the US). Now ask yourself, who do you want to win ? The rules of this video combat are easy. Go here and by watching, sharing, commenting and tweeting the support-video of either camp you contribute to the outcome. My choice is the incumbent, no surprise there. Advertising agencies on Facebook: do you practice what you preach? Surprising is that many international networks don’t seem to do anything on FB or when they do have a page take it to any interesting level. I would like to do a quick survey of AU/NZ agencies on Facebook. Which ones do you value and became a fan of? What are success criteria, do you think you would “buy” fans through FB-ads and promotions? What is the best tonality for clients, talents, employees alike? In my experience agency websites are a one-time affair for users. Even your own clients never return to check up on your latest and greatest work. This leads most agencies to start putting out a newsletter, and it is uncanny how soon those slow down to a trickle and get abandoned. At Razorfish/NeueDigitale I started a podcast which died an unceremonious death after one episode (doesn’t really qualify as a podcast really). The NetX newsletter was dumped after three issues. A newsletter suggests that all content has to be fairly significant and important to the business of the reader. Internal culture and social news hardly feel appropriate – which is strange because creative agencies’ reputation thrives on how much extra-curricular and non-commercial things go on. And it is an important decision factor for talent as well as clients. Facebook on the other hand is a place where the private and public sphere mix harmoniously, where social and commercial infos can blend in one stream. 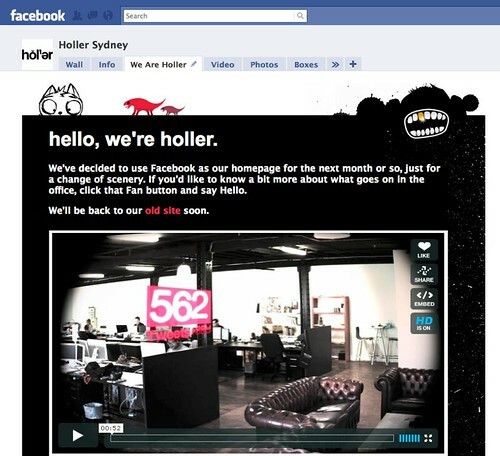 Holler has been servicing different brands in Facebook for 2 years now and 2 of our staff are full-time content and community managers. We built a customised tab in FBML displaying a little time-lapse film of our studio, 4 pieces of work and a bit of the usual “This is us” copy with a hint at getting in touch or (dare we say it?) “become a fan“. (Note to self, the line”click that Fan button” should say “LIKE” by now). This is the page that every new (non-fan) visitor of Holler would land on. Updates happen naturally on the Wall, if a post needs more links, space and integrated media we use our customized Tumblr blog. Since we switched to a Facebook page the amount of fans and job applications from talent have steadily increased. We can stay in touch with this growing audience on an ad-hoc basis, in a casual tone and without worrying if messages fit a certain category. It is hardly an accurate measurement but we believe that our rating of second hottest digital agency in the region is also a result of more people staying in touch with our work as well as culture. Geekvertising collated a list of the likes/fans of UK and US agencies split by networks. I reckon it is time to ask the people running these page for a more qualitative analysis, using the amount of interactions per post, photos, intervals of postings and so on. Admittedly, the effects of these pages on the agencies might only be supported by anecdotal evidence (e.g. better qualified applicants). Fallen out of love with Twitter? Well, my industry column has. So except for a few automated tweets coming via my linked accounts of blip.fm, slideshare or this blog I have been silent. I don’t really miss it. Nobody has expressed missing me on there (so far). It seems like I wasn’t alone in giving up. My “Industry” column inside Tweetdeck fell from about 30 active, daily twitterers (out of 65) to about 5 – 10. Events such AIMIA awards or AdTech give it a “real-time info” jolt but it still feels slower. And recent converts like ex-SMH’s TheRealSamNorth got christened at The Digital Citizen meetup and instantly slacked off as well. Admittedly, that’s all very anecdotal evidence. But the people still twittering are mostly senior agency people with a vested interest in keeping the Twitter conversation going. Is Twitter going 180 degrees back to (social) geekdom? I am happy for you to call me a traitor and prove me wrong with (Australian) stats but does it only work for real-time events and breaking news?